During my brief time in China, I’ve learned that I have at least one important thing in common with the Chinese people. I’m a sports fan, and this is one sports-crazy nation. A national celebration erupted here today with the announcement by the International Olympic Committee that Beijing has been selected as the host city for the 2022 Winter Olympics. Seven years ago Beijing hosted the Summer Olympics, and will now become the first city in history to host both Summer and Winter Olympic games. 1. Beijing annually gets about as much snow as Memphis. 2. Beijing is not in the mountains. Anything remotely resembling a ski slope in China is at least a couple of hours north of Beijing. 3. Given the absence of snow and mountains in Beijing, Gatlinburg would seem to be a more sensible choice for the winter games. But here’s what Beijing intends to do, and believe me, they will pull it off. First, events such as figure skating, ice skating, and even bob sledding will be held in the city of Beijing using many of the same facilities that were used for the 2008 Summer Olympics. Curling will be held in Chinese beauty shops. The Chinese plan to build more high-speed trains that will transport athletes, media, and thousands of sports fans from Beijing to the ski slopes in less than an hour, as China’s high-speed trains run at approximately 200 km per hour. I’ve been on one of these trains, and believe me, they’re like a ride at Disney World. Beijing’s successful quest to host the Winter Olympics was led by an athlete very well known to American sports fans, former NBA superstar Yao Ming. Yao is the most popular athlete in China. He was chosen to carry the Olympic torch into the Bird’s Nest, Beijing’s Olympic Stadium, for the opening ceremony for the 2008 Olympics. When the International Olympic Committee made its announcement today of its selection of Beijing to host the 2022 Winter Olympics, Yao was front and center as the designated “Olympic Ambassador” of China. The China Daily, Beijing’s English newspaper, described Yao as “a towering presence” for China’s Olympic spirit. Basketball is enormously popular in China. Last week, Memphis Grizzlies Guard Mike Conley led China’s NBA National 2015 Tour, hosting basketball clinics in Beijing, Shanghai, Chengdu and Shenzhen. 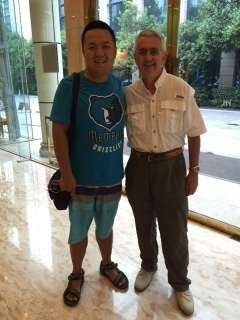 The other morning I encountered a fellow Memphis Grizzlies fan in the lobby of a hotel in Xian. At least I thought he was a Grizzlies fan, since, as reflected in the photo below, he was wearing a beautiful Beale Street blue Grizzlies shirt. I could hardly contain my enthusiasm, so I ran up to him and shouted, “Go Grizz!” He just starred at me. I was assisted by my interpreter, my son Will, who speaks Mandarin. Will began to converse with the gentleman who told us he was an NBA fan, did not really know much about the Grizzlies, and bought the shirt at an NBA store in Xian for the simple reason it had the name and the logo of an NBA franchise. It was the Olympic spirit alive and well. And so we posed together for a photograph, two NBA fans in China! I only wish Mike Conley and Yao had been there to join us! NEXT WEEK: Next week, we say goodbye to China with the worst pun in the history of both the Chinese and the English languages. David Leake: You and the family have a safe trip home.